Want Big Profits? Show Up Everywhere Your Customers Surf. 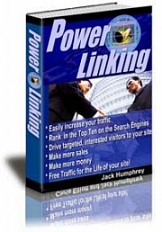 Today, it’s your turn to unleash the traffic generating fury of Power Linking into your website business and completely overwhelm your website with all of the free, targeted traffic that’s ready to pay you good money for your products or services. Complete Online Business Package - Get Started Today!